Have any of you tried this before? If you have, let me know and share your experience! I’m all about space saving as well as being prepared and over the years I would say my ability to pack lightly yet be prepared for different situations has improved greatly. I have been on short-haul trips with just hand-luggage (10kg limit, although I have never gone above 5kg) and long-haul trips (22kg limit). The short-haul trips have lasted from as little as 6 days to 42 days, whilst my long trips have been around 90/95 days. Different lengths, different needs. 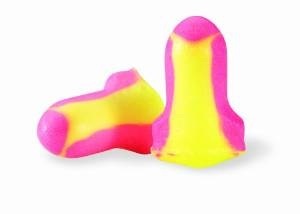 You may find this a little bit strange that the first ever tip, trick and hack I post on this blog is about ear plugs. Personally, I have found them to be a life saver or rather a sleep saver as life is never fun when you are always tired. Personally, I am a light sleeper. I can wake up to pretty much everything whether it is light or sound. At home, I have a black out blind on my bedroom window but also have the tendency to sleep with the duvet over my head at home or away, as for sound… My phone alarm is set to vibrate, no ringtone because I will wake to it going off. Never slept through an alarm, ever. The only time I sleep through things is if I’m ill or have had a few nights of poor sleep that my body needs it, or strangely if I have been swimming but that’s more to do with chlorine which I am a bit sensitive too. Anyways, since purchasing 20 pairs for the grand price of £2, I carry them everywhere whether I am travelling in my home country or abroad, using them in both hostels and hotels as I struggle that much. They are great for concerts too! Most people in shared accommodation are courteous to other guests at any time of day or night, but this isn’t always the case. If you are lucky enough to be one of those people that can sleep through everything or almost everything like one of my travel buddies, their will come a time and a place when this doesn’t happen for whatever reason. My last trip with one of my travel buddies is a testament to that and we have travelled a lot together, visiting many places in Europe and sharing a bunk bed meant that if one person was struggling to sleep, often the other knew about it. Therefore I recommend always carrying a pair whatever kind of sleeper you are -Actually carry 2 or 3 pairs, just in case. Some of my 20 pairs I have given to others and they work a treat, or so they say! Foam earplugs are the most popular but after a while, they lose elasticity so an extra set is useful if this happens to one earplug or both. Let me know of your experience with ear plugs or let me know if you give them a try!